This beautiful southern colonial has tremendous curb appeal. The front facade features a large front porch, architectural detailed exterior, dormer windows, and carriage garaged doors. No attention to detail is spared on the curb appeal of this home. It offers traditional southern colonial styling to include large front porch, gabled roof, dormers as well as a spacious two car garage with carriage doors. Architectural detail is added with a combination of shake and beadboard siding, decorative dentil block and brick to grade on the front. This beautiful entryway boasts a custom front door with transom and sidelights. The natural light is enhanced by a custom sconce, chandelier and recessed lights. This dining room is defined by architectural columns which allow for the open design. The look is enhanced with designer wallpaper, 3-piece crown molding, chair rail with backer molding. It includes a butlers pantry with granite tops and glass front cabinets with under cabinet lighting. Entering through glass french doors one is struck by the beautiful bay window. This study is full of light and architectural detail. The study has upgraded base and window trim as well as 3 piece crown molding. The natural light is enhanced with recessed lighting and a ceiling fan. Flooring throughout the first floor is hand-scraped hickory hardwood. This kitchen features a huge island with built-in microwave,under-counter refrigerator, bookcase, large prep sink and wine rack. Custom cabinetry with an antique glaze, custom hood fan, granite countertops, raised bar countertop, and a custom backsplash completes the living space. The morning room off of the kitchen has a large picture window, built-in benches, and a breakfast nook.The French doors lead to a spacious screened in porch. Just off the kitchen, the family room boasts a coffered ceiling, wainscoting, custom chair rail, and hand scraped hickory hardwood flooring. The focal point is a beautiful masonry woodburning fireplace flanked by custom built-in shelving and windows. This traditional southern style porch features composite decking, exterior grade ceiling fans, recessed lights vinyl soffit ceiling. The gracious powder room has plenty of natural light. The room is enhanced with the beadboard, upgraded trim, and crown molding. The upper hallway of this home features hand scraped hardwood flooring, a linen closet and a laundry room with additional storage. A full bathroom off of guest bedroom features large white vanity with granite counter tops, under mount sink, large white vanities. Expansive bedroom with dormers with built-in window seats. Detailed trim and molding add character to this bedroom. The master bedroom features a tray ceiling with crown molding and uplighting. Hand scraped hardwood flooring and paneled wall detail. there are two separate walk-in closets a large sitting room with vaulted ceiling and bay window. The spacious master bathroom has tall cherry vanities with warm granite countertops, and large tumbled tile flooring. There is a large roman shower with two waterfall shower heads, tumbled floor tile, glass tile insert and built-in shelves and seats. A private toilet room and separate linen closet make this a very desirable bathroom. Large double vanities with granite vanity tops exude elegance while supplying generous storage options. A full basement bathroom with spacious white cabinetry and dark granite countertop, tub and shower combination with white tile. Guest bedroom in the basement with natural light added by egress window. 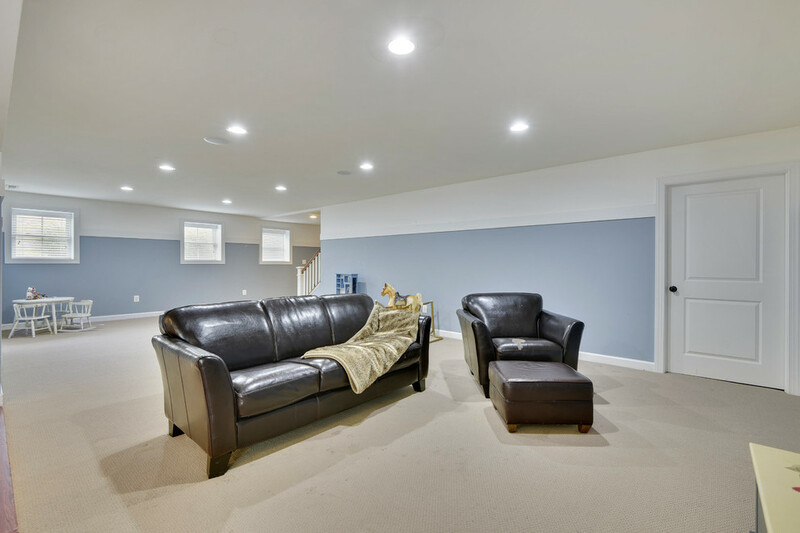 This large basement recreation allows extra entertaining and living space. It has full-size windows, french doors to the exterior, laminate wood flooring, a double closet for extra storage, built-in bookcases, and a double welled exit stairs.